You read the news about worsening air and water pollution, climate change, droughts and diminishing natural resources, and you worry if your family will have a healthy future. The problem seems so big and overwhelming. What can you do? Why bother? I’m here to tell you: You have the power and it starts right at home. Having a nine year-old daughter who is the center of my world, I see the proverbial “writing on the wall” with where we are headed environmentally. I have wanted to throw up my hands at what seems like an unsurmountable, hopeless problem. I fear for my daughter’s future. That’s why I wrote this book. Change starts with each of us, right where we each live. It’s not all or nothing. By making a series of small, doable “baby-step” changes, in aggregate, you will make a big difference—in your wallet and in the health of the air, water and soil we depend on. In this book I’ll share my extensive research into why today’s environmental problems exist. I’ll give you all the facts and data you need to understand the issues, then share simple steps that you can easily implement right away. You can start saving hundreds or even thousands of dollars a year, be empowered to greater self-sufficiency, reduce your carbon, water, energy and consumption footprints and have a tangible sense that you ARE making that difference. Sustainability Starts at Home will show you how to do all of this, plus give you hundreds more inspiring tips that will save you thousands of dollars a year—simply by making adjustments to how you maintain your home and make your day-to-day purchases. This book pays for itself (and then some) with the first tip you implement! I know that if you are here on this page, you are deeply concerned about the state of the world, and you worry about where we are headed if we keep doing things the same old way we always have been. And, I know you care a lot about the environment and your family’s future. You feel passionate about making a difference. But it can often be challenging to know where to start. And if you’ve already started and gotten comfortable with things like composting or making your own non-toxic housecleaning solutions, you might want to know how to take your passion for green living and self-sufficiency to the next level. This book has just what you need! 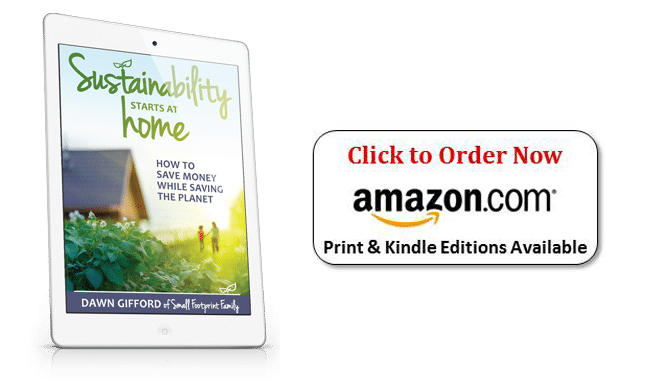 Sustainability Starts at Home has 338 large-print pages of ideas, tips, facts and inspiration to help you live a simpler, more sustainable and frugal life—no matter what level of knowledge you are starting from. You can do it, and every little effort does make a difference! Get the book and begin your transformation to a healthier, happier, more sustainable life today!